The Montenegrin coast along the Adriatic sea is 295 km long, with 72 km of beaches, and with many picturesque ancient old towns. In the north it's primarily a steep coast with many bays and promontories, while south of Ulcinj and towards Albania the landscape is more gentle with endless, sandy beaches. In the north the bay of Kotor, a UNESCO world heritage site, extends deeply into the land and is a submerged river canyon. In the centre the Budva riviera is a popular tourist hotspot with several beach resort cities. Sveti Stefan is an islet connected to the mainland by a bridge which has been completely converted into a large resort. Further to the south around Dobra Voda there are several hotels along the rocky coast. 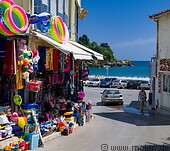 Ulcinj is a coastal city populated mostly by ethnic Albanians. South of it there are several sandy beaches where kitesurfing is practised. 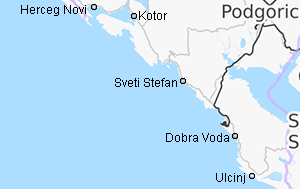 It is possible to access the coast by road (either by car or by bus) or by plane to Tivat. There are also ferries to Italy.